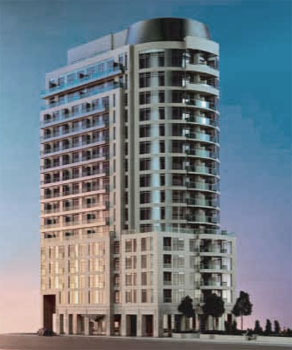 Lotus Condominium located in Yorkville at a triangular lot in the South West corner of Yonge and Devenport st. The entrance for the building is at 8 Scollard St.
Lotus condo consist of 161 units with 27 different designs. Suite sizes vary from 415 to 1800 square feet. Suite Mix at Lotus : Lotus condo has studio, 1 and 2 bed room suites ranging from 415 square feet to well over 1080 square feet. If you are interested in buying or selling a condo suite in the Lotus Condo, please feel free to call me or send an email for detailed information.